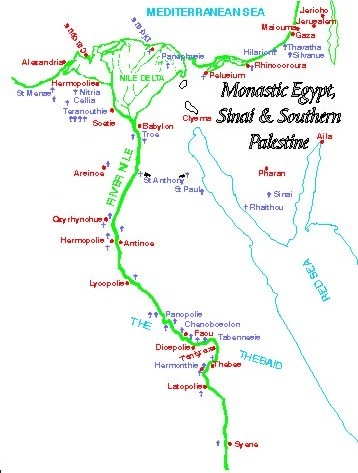 Christian monasticism had its roots in the Egyptian deserts. The first champion of monasticism was the great Egyptian Desert Father Anthony the Great, who died in AD 356 at the age of 105. He set an example that was followed by many. Hermitages were soon being set up all over the Nitrian and Sketic deserts. Toward the end of the fourth century there must have been well over 20,000 hermits in Egypt, scattered all over the country and living either alone or in colonies. Before long, monasticism had reached the Near East and Asia Minor, where it took on a wide variety of forms in the fourth and fifth centuries. It also spread into the Western world, where in the sixth century it found its legislator in the person of St. Benedict of Nursia. The Christian hermits appear in ecclesiastical history under many names. They were called “ascetics” because of their austere spiritual exercises, “hermits” because they lived in the desert, “anchorites” because of their retirement from the world, and “recluses” because they shut themselves off. The hermitages and the colonies of monks in the Nitrian and Thebaid deserts attracted many visitors, some of whom were seeking a religious uplift, while others were disgusted by the pampered life of the towns and were on a sort of “back-to-nature” quest. The monks and hermits were regarded as the receptacles of the Spirit. Their words were therefore cherished as a guide in difficult times. And even if the anchorites were often reluctant to speak, the mere sight of them gave comfort and fortitude to many. The pilgrims came from all quarters of the compass. There were sea routes to Alexandria from the whole of the Mediterranean, and it was fairly easy to reach the monasteries and hermitages from there. Anthony the Great was the first nucleus around which a colony of monks crystallized. While he was still alive, Amoun (died C.356) established an anchoritic community in the Nitrian desert in Lower Egypt which is supposed to have comprised 500 members and had its own church. The hermits worked to earn their living. Hours of work and of prayer were exactly regulated. The monastic principle of “Work and Pray” was accordingly being applied even at this early date. Even stricter rules were adopted in the colony that came into existence under Macarius the Great (died C.390) in the desert of Scete or Sketis about 15 kilometers south of the Nitrian Mountains, near the village of Kellea. The hermits here lived in very humble conditions in wooden cells or in caves. Silence was observed at all times. Only on Saturdays and Sundays did the monks meet for a joint divine service in the church. In Upper Egypt it was Palemon who gathered a community of hermits around him. The first known organizer and legislator of a monastic community was Abbot Pachomius (died 346), a pupil of the anchorite Palemon. 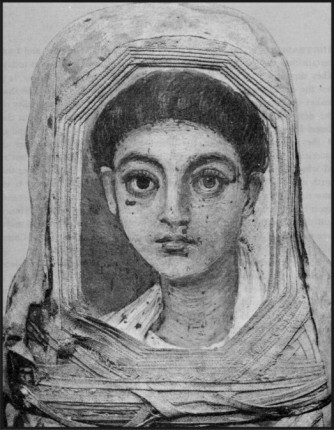 It was around 320 that Pachomius founded a large monastery in Tabennisi in Upper Egypt which was marked by almost military severity in its practical framework of liturgical prayer, work and economic management, though there was as yet no exact regulation of the individual quest for salvation. Pachomius expected of his monks, as basic requirements, “simple clothing, moderate eating and reasonable refreshment and sleep”. He also considered it important that his monks should remain laymen. If a Eucharistic liturgy was to be celebrated, he had a priest come from the neighbourhood. None of the brothers was to have priestly powers or to strive for spiritual rank, lest this should cause quarrels and jealousy in community life.